Some pyrography. The central symbol is Odroerir, with the three horns containing the mead of poetry stolen by Odin in Suttung home. This design contains the whole Elder Futhark, something obvious talking about wisdom and poetry isn't it? 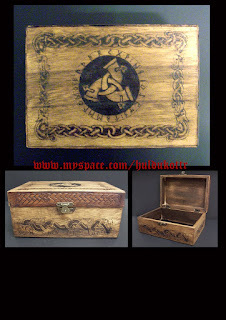 The box sides are adorned with dragons inspired by the Oseberg style. a new poetic account of the ancient Norse tale and written in the old Norse form of Fornyrdislag.